Published on 28. 05. 2013 in comics and cartooning and hype & linkage. Closed Tags: Copenhagen Comics, Kuti, The Storm P. Museum. A Danish edition of the internationally distinguished Finnish comics newspaper will be released in Copenhagen this Friday. The release is marked by a reception at the Storm P. Museum, just in time for Copenhagen Comics — the grand, international comics festival which will take place in Øksnehallen, Copenhagen, this coming weekend. 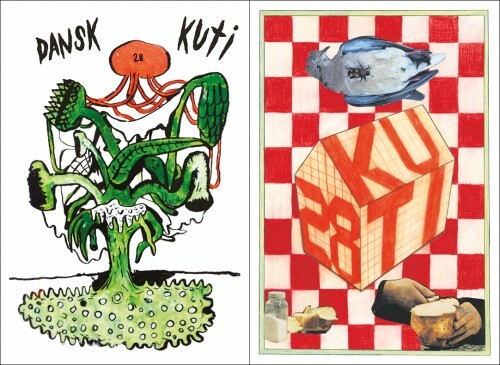 Comics people on the festival circuit or their ear to the underground will be familiar with the free Kuti anthology, which since the early issues has been published with English subtitles and has already seen several local edition featuring cartoonists of a particular country. The Danish edition is the 28th issue published so far and half of it is entirely devoted to Danish artists. The editors of this section are Zven Balslev, Søren Mosdal, and Jacob Ørsted, while the other half, published under a separate cover on the flipside, has been edited by the publisher at the Kuti Kuti studio in Helsinki. Artists included in the Danish section: Rikke Bakman, Johan F. Krarup, Storm P., Claus Deleuran, Zven Balslev (who has also provided the cover for the section, above left), Jacob Ørsted, Jon Andersen, Rikke Villadsen, Jan Oksbøl Callesen, Søren Mosdal, Bue Bredsdorff, Karla Holmbäck og Luca Bjørnsten. In addition to this, the section includes two articles on Danish comics, by Erik Barkman and yours truly. Come to the reception and kick off your convention weekend in style. The Storm P. Museum is currently showing an impressive exhibition on the Japanese ‘God of Comics’ Osamu Tezuka, in case you need more convincing. If you are unable to come, pick up a copy at the festival or read in online here.